The third book in the critically acclaimed series set in Classical Athens, featuring the historically-inspired amateur detective Nicolaos. 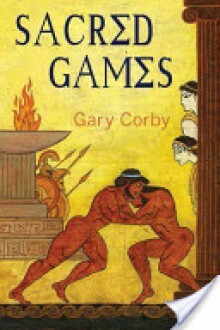 It is the Olympics of 460 BC. Nico's best friend, Timodemus, is a competitor in the pankration, the deadly martial art of ancient Greece. Timo is hot favorite to win. His only serious rival is Parmonos from Sparta. When Parmonos is found beaten to death, it is obvious Timodemus must be the killer. Who else could have killed the second-best fighter in all Hellas but the very best? The Judges of the Games sentence Timodemus to be executed in four days' time, as soon as the Sacred Games have finished. Complicating everything is the fact that Athens and Sparta are already at each other's throats, in the opening stages of a power struggle for control of Hellas. If an Athenian is found to have cheated at the Games by murdering a Spartan, it will be everything the hawks in Sparta need to declare open war the moment the Sacred Truce is over. And that's a war Athens cannot hope to win. Nico and his partner in sleuthing, the annoyingly clever priestess Diotima, have four days to save their friend and avert a war that would tear their world apart.